I'm pretty darn excited to be hosting a TLC Book Tours stop for the cookbook Signs & Seasons: Feed Your Sign the Food it Craves today! Between them, he wife and husband duo of artist Amy Zerner and astrologer Monte Farber have created so many amazing contributions to the spiritual and metaphysical world. I have read several of their books, own the out-of-print Zerner-Farber tarot deck and it's accompanying book, The Instant Tarot Reader, so when I found out that, along with Chef John Okas, they'd written a cookbook, I jumped at the chance to review it. 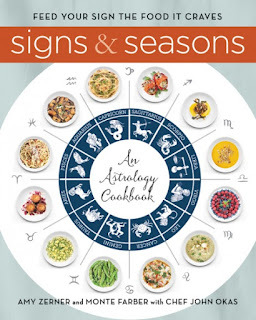 Signs & Seasons takes an astrological approach to cooking and eating, and the recipes within were "written from the perspective that when the sun is in a certain sign, all individuals, regardless of their dates of birth, share in the characteristics and energy matrix of that stage and season of the cycle". In other words, instead of trying to cater to individuals, the sign designations within the cookbook refer mostly to the recipes themselves. They focus on seasonality and preparations methods that reflect aspects of each signs mind-set. I highly recommend that you read the Introduction to this cookbook, as it will greatly help you understand how and why this book was written and the recipes were developed. Of course, I'm a firm believer that a cookbook is only as good as it's Introduction and writing, so I always recommend that. I mean, if you skipped the intro, you might be wondering why all of the recipes are Mediterranean. 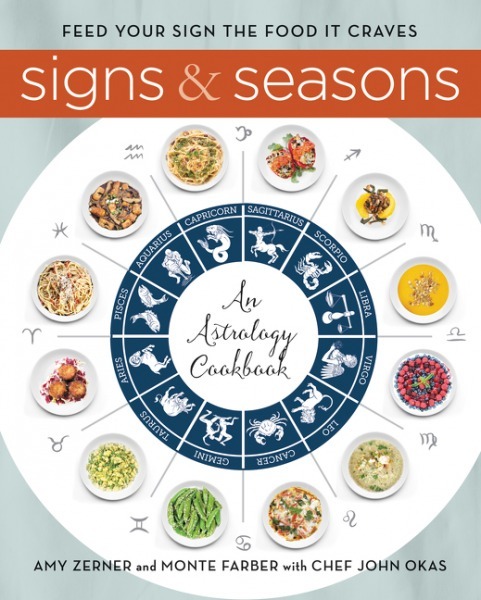 Well, since the book is not only about food, but also astrology, we learn that's because the planets are named from Greco-Roman gods, hence the primarily Roman and Greece-based Mediterranean influences throughout. 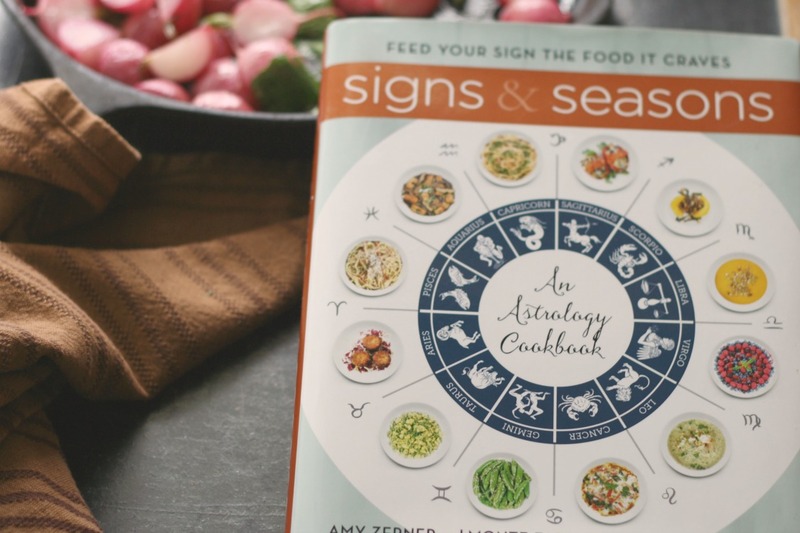 After the Introduction, there is a fun section called How Each Sign Eats, Cooks, and Entertains that lists each zodiac sign (with dates), its ruling planet, quality, element, personal qualities, key words, and foods and herbs attributed to each. It then talks about How They Eat, How They Cook, and How They Entertain. I happen to be a Scorpio (through and through - it's my sun sign and my moon sign)...and while I've the inherent qualities and characteristics given to Scorpios are almost always me to a tee, I did disagree with a couple of things said on these pages - which may have a lot to do with the fact that food and feeding are my "field". For example, it said that "Scorpios will do their best to eat alone or hidden in some way when they have to eat in public"—and well, that's not me. It also says we prefer to cook alone, and I love a group effort having always gathered in crowded family kitchens and worked on the line in restaurants. It also states we need a powerful reason to share our cooking prowess with a group of people. I share my cooking prowess any chance I get, but I suppose that instant gratification and nourishing my loved ones (and those I've just met), are both pretty powerful reasons. Shall we talk about the actual recipes? There are photos that appear at the beginning of each "season" (as opposed to next to individual recipes) that are just okay. No amazing food styling, just straight-up shots of the dish that look like they were probably snapped on somebody's phone...and there's nothing wrong with that. The book's more about the premise, I just wanted to point it out since photos can be a make-it-or-break-it for some people where cookbooks are concerned. Most of the food sounds good. A few recipes sound amazing. But I will say that a lot of the recipes do seem a little fussy. I would have loved to see a much longer list of foods/ingredients/herbs listed for each sign, as well. The chapters are divided into seasons, with the corresponding 3 signs for that season having featured ingredients/recipes. Remember what I said before, if you didn't read the intro, you probably won't understand why there isn't at least one recipe for any given sign in each section. So remember, the recipes refer to the signs themselves, not necessarily individuals. Since it's spring, I wanted to choose something seasonal, so I chose an Aries designated recipe from the Spring chapter. So, while it's true that I'm not an Aries, the recipe worked well for the time of year...it was just what I needed. In the first month of spring, as we emerge from the time of Pisces, the Light just barely overcomes the Darkness. Feeling the night at his back, the Aries is driven to charge forth into the day. Aries balances nostalgia with impatience. Aries cuts through any lingering ambivalence with a sharp passion and a sense of urgency. 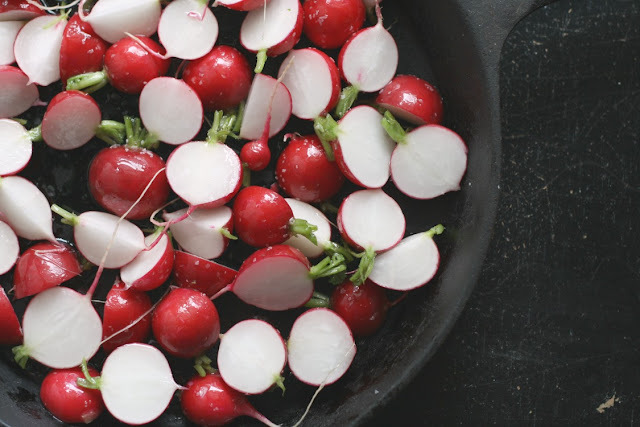 The radish—crisp, red, peppery-piquant root of early spring—has the bite of Aries. 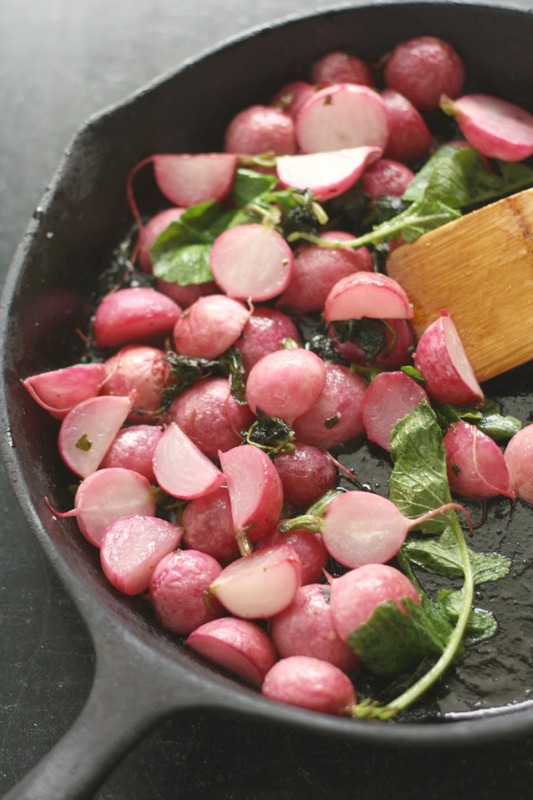 Radishes are usually eaten raw, but roasting them concentrates their sharpness, and the wasabi dressing hones their edge. fun features: Come on...the whole concept is fun! about the authors: Since 1988, AMY ZERNER, a U.S. National Endowment for the Arts award-winning fine artist, and her husband, author MONTE FARBER, have created what they call their family of “spiritual power tools,” including The Enchanted Tarot, Instant Tarot, Sun Sign Secrets, Karma Cards, Little Reminders: The Law of Attraction Deck, Chakra Meditation Kit, The Truth Fairy Pendulum Kit, The Soulmate Path and Quantum Affirmations. There are over two million copies of their works in print in sixteen languages. The couple lives in East Hampton, NY. They believe that adding love, light, and laughter to everything one cooks is essential to creating great meals and a great life. CHEF JOHN OKAS began his career in childhood, cooking alongside his Sicilian grandmother in their family kitchen. He has cooked at Paradox in Manhattan, Georgette’s in Easthampton, and the Captiva Inn in Florida. Under the pen name John Penza, he is the author of Sicilian-American Pasta and Sicilian Vegetarian Cooking. He currently lives in Bridgehampton, New York, where he is a personal chef and is also associated with the Highway Restaurant. 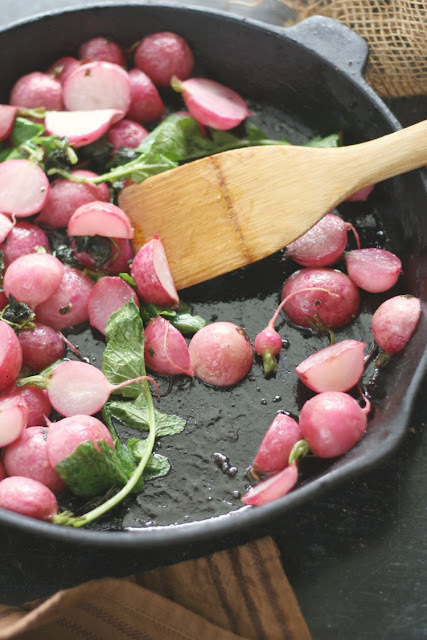 Roasting radishes concentrates their sharp bite, and the wasabi dressing hones their edge. 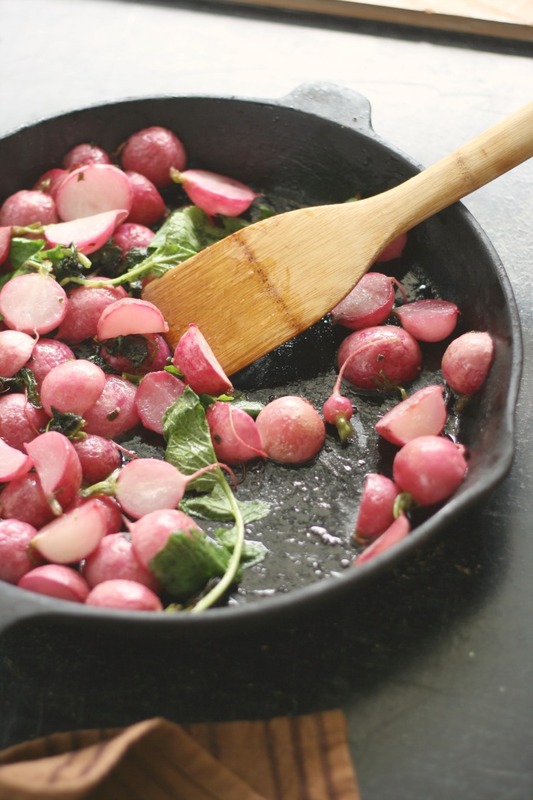 Slice the radishes in half lengthwise, or quarter them if they are large. Combine all of the ingredients for the dressing and whisk or shake until emulsified. 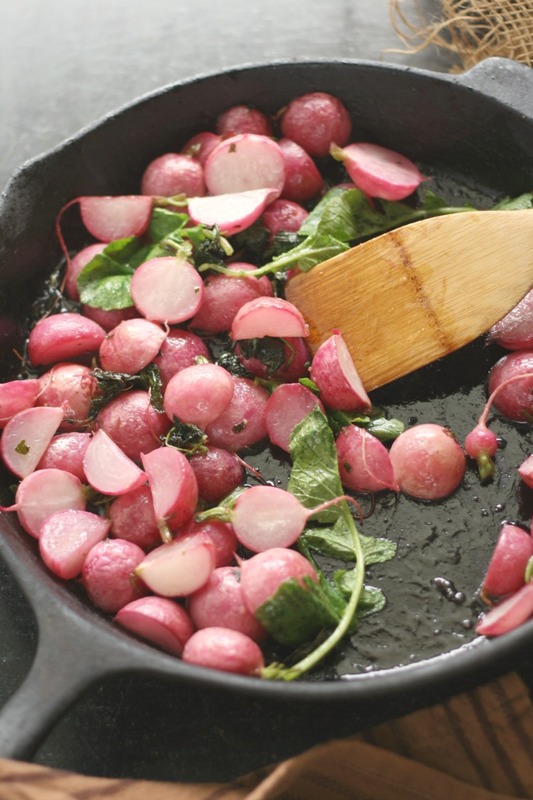 Add the wasabi butter dressing to the radishes while they are still hot from the oven, toss to combine. Serve immediately. I used a 12-inch cast-iron skillet in place of a rimmed baking sheet. The recipe originally stated that it should take about 15 minutes, but it took mine an extra 5...most likely because it wasn't spread out as much in a pan as it would have been on a sheet. I also threw in a handful of the radish greens.